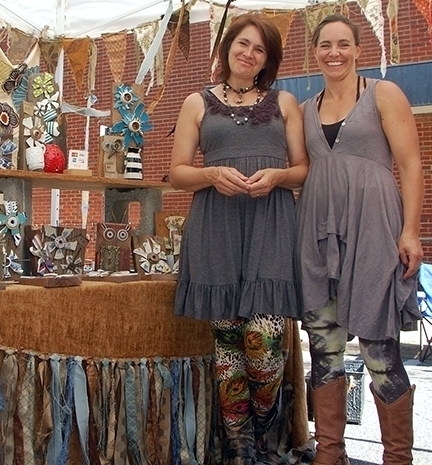 Foothills Folk Art Festival wins statewide award and gears up for the next festival. On March 14, 2018 at an awards ceremony in Clayton, NC, the Foothills Folk Art Festival won a statewide award from the N.C. Department of Commerce, for Best Downtown Special Event. A panel of judges chose the award winners from dozens of applications submitted from throughout the state; and NC government officials presented the award to Newton Mayor Anne Stedman and Hickory Museum of Art Executive Director Jon Carfagno. The festival's principal organizers, Shannon Johnson, Newton’s Main Street Program coordinator, and Clarissa Starnes, Associate Director of Hickory Museum of Art and the Foothills Folk Art Festival artist contact, were also at the awards ceremony. The Third Annual Foothills Folk Art Festival will take place on Saturday, October 6, 2018 from 10 AM to 4 PM in Downtown Newton. This family friendly festival, expected to once more draw thousands of visitors from throughout the region, will again showcase a variety of local and regional contemporary folk artists whose work will be for sale, as well as artist demos, hands-on art activities for kids, two locations with free live music, food from area restaurants and food truck vendors, beer gardens, and more. The Foothills Folk Art Festival is a juried event dedicated to folk art. The festival's artist committee is looking for themed artwork intensely influenced by and displaying the spirit of folk, visionary, and outsider art. Information for artists wishing to be considered for participation in the 2018 festival is here. Says Clarissa Starnes about the festival award, "We would like to thank the many hands that went into making last year's event a success, including the artists, participants, sponsors, local businesses, volunteers, staff members, and visitors to the Festival! We look forward to an even bigger, better Festival this October!" More information about the Foothills Folk Art Festival itself, including signing up to volunteer, here. The art of the elementary school division of this annual show were on exhibit until April 3. Classes for children, teens and adults in April and May 2018 and edging into summer. Let your artistic creativity flow! Includes registration deadlines and a link to the application form. Awww - you just missed Joel Sartore's photographs. HMA's exhibition ENDANGERED: Joel Sartore Retrospective closed February 25, 2018. But Matt Diffee's show opens March 3! Never a dull moment at HMA. 2018 Art classes that make children and tweens happy! Check out these classes that will be offered through February, and download the registration form. HMA always has many different exhibits going on at the same time. Some, like Joel Sartore's gorgeous animal photography right now, stay up for quite a while. Others, like these three, stay up for just a few months. Don't miss them! Why are these people smiling, and what's in that box? Last September, Jon Carfagno and Clarissa Starnes drove to Columbia SC to pick up this box. You learned at our big unveiling event on November 18th what was in it. And now you can see for yourself! Whimsical pottery and drawings by North Carolina native Stacy Lambert are being presented in HMA's Local Artist Gallery in conjunction with New Horizons: Self-Taught Art in The 21st Century (September 23, 2017 - January 7, 2018). HMA memberships: so many benefits! Please congratulate our new 2017/2018 Board of Trustees inducted at our Annual Meeting on June 22, 2017! Click here to see the complete Annual Meeting presentation, including descriptions of earlier, current and coming exhibitions and events. Clarissa Starnes, the organizer of the twice-monthly Coffee in the Coe, says that her inspiration was the European coffee houses of the early 1900’s where people sat for hours discussing a broad range of ideas, including art. She thought, “When do people now get together to discuss art? And how can HMA facilitate doing this in a safe no-right-or-wrong environment?” Coffee in the Coe is structured as an answer to those questions. The Hickory Museum of Art has announced a leadership team for the museum that consists of a new Executive Director and a newly formed Associate Director position. The museum is proud to announce that Jon Carfagno has been named the museum’s new Executive Director, and Clarissa Starnes has been promoted to the position of Associate Director. In addition to these changes, the museum’s current bookkeeper, Mary Johnson, has been promoted to the position of Business Manager. Carfagno succeeds Lisë Swensson, who announced her retirement in 2016 and will leave after 13 successful years as the museum’s Executive Director. Carfagno will assume his role at the Hickory Museum of Art on April 1st, 2017. He was selected after a national search overseen by a committee appointed by the museum’s Board. After serving internships at museums in Connecticut, Massachusetts and Berlin, Jon Carfagno joined the Education Department of the Museum of Fine Arts in Houston, Texas in 2005. He grew in his role to become the School Programs Manager, where he planned and administered all the professional development and curriculum initiatives for K-12 educators. He then joined the Grand Rapids Art Museum in June 2009 to serve as their Director of Learning and Audience Engagement. He led numerous initiatives that brought local, statewide and national recognition to the museum during his time. For instance, Design Briefs, an entrepreneurial start up incubator program he created in collaboration with thought leaders from the West Michigan technology community, was featured on both an internationally attended webinar and the Alliance of American Museum’s Center for the Future of Museums website. Currently, Jon serves as the Vice President of the Board for the Museum Education Roundtable a national board that publishes the Journal of Museum Education. He led the Education Department at GRAM in receiving the Distinguished Service Award from the Michigan Art Education Association in 2013. Last fall, he was invited to the National Gallery of Art in Washington, DC, to participate with a group of art museum education department leaders to envision a professional services organization designed to support of the future of leadership in the field. A frequent speaker on the topics of human centered design, methods of innovation, and organizational theory, Mr. Carfagno is most actively concerned about museum futures, sustainability, and inclusion. He holds an M.A. in Art History with a Distinction from the University of Massachusetts and completed Kendall College of Art and Design’s MBA Certificate Program in Design and Innovation Management. Jon is married to Megan Carfagno, and they have two children. Clarissa Starnes has served as the Collections and Shop HMA Manager of the Hickory Museum of Art since 2015. During her time at the museum, Starnes has focused on promoting and enhancing publicity of local artists through festivals, exhibitions, and the museum store. She has several years of experience as an Art for All Coordinator with the museum, teaching art lessons and planning art projects for a variety of members in the surrounding community. She holds a Bachelor of Arts with a minor in Visual Arts from Lenoir-Rhyne University, where she graduated with First Honors, was on the President’s List for each of the years of her enrollment, and received the Margaret A. Berry Art Award for several years in a row. Starnes will serve as the Associate Director for the Hickory Museum of Art, where she will focus on the management of museum operations and opportunities to engage a larger and diverse audience to the organization’s events, exhibitions, and festivals. She will also continue to serve as Collections Manager for the large selection of artwork currently owned by the museum. She will assume this role and responsibility on April 1st, 2017. Mary Johnson has been with the museum since 2002, serving in several roles including Membership Coordinator, Administrative Assistant, and her current role as Bookkeeper and Office Manager. She holds an Associate of Applied Science degree in Business Administration, and has over 30 years of bookkeeping experience. In her new role as Business Manager, Johnson will continue to manage the financial aspects of the museum but will also assume responsibilities for other business-related aspects of the museum. The Hickory Museum of Art is an art museum in downtown Hickory, North Carolina that holds exhibitions, events, and public educational programs based on a permanent collection of 19th through 21st century American art. The museum also features a long-term exhibition of Southern contemporary folk art, showcasing the work of self-taught artists from around the region. The Hickory Museum of Art is North Carolina’s second oldest museum, established in 1944 by local artist Paul Whitener. The museum’s permanent collection includes over 2,000 art objects, ranging from Hudson River School paintings, American art pottery, Glass Art, High-Speed Photography, and the work of regional artists. The North Carolina Folk Art Society (NCFAS) invites the community to participate in its upcoming quarterly meeting 12-4 p.m. Saturday, Jan. 28 at Hickory Museum of Art. Hickory, NC – Lisë Swensson, who helped attract artists and exhibits from around the world to Hickory Museum of Art (HMA) and expanded its reach in the local community during more than 12 years as executive director, announced recently that she will retire. Swensson, 65, who became HMA executive director in 2003, plans to leave her job in March 2017, giving the Museum’s board six months to search for a replacement. Once her successor has been identified and employed by the Museum, she looks forward to continuing work in areas of art education, community arts, exhibitions and arts fundraising. Swensson is also eager to try her hand at art sales. While she is sad to be leaving her work at HMA, Swensson said she is proud of the Museum’s accomplishments during her time as executive director. HMA Board President Alan Jackson said Swensson has brought a high level of creativity, professionalism and enthusiasm to Hickory Museum of Art, which would not be the organization it is today if not for her energy and passion. Kathryn Greathouse, executive director of the United Arts Council of Catawba County, said Swensson has made a tremendous contribution to HMA and the arts community in the Catawba Valley. Under Swensson’s guidance, the Museum drew nationally and internationally known artists and works, such as Israeli sculptor Orna Ben Ami’s exhibit, “The Softness of Iron,” and “Unexpected Beauty,” a collection of photos by Steve McCurry, who took the famous “Afghan Girl” photo that appeared on the cover of National Geographic in 1984. HMA partnered with the Catawba Valley Camera Club on the McCurry exhibit, which closed this past May. In 2005, the Museum displayed “AFTERMATH,” an exhibition by New York photographer Joel Meyerowitz documenting the 9/11 terror attacks. The exhibit’s journey to Hickory began with a simple car trip that Swensson took. While driving to work the month after September 11, 2001, Swensson heard part of a radio interview with the nationally recognized Meyerowitz discussing his project documenting the monumental clean-up process at Ground Zero. Former HMA board member and past president Mary Elizabeth Geitner said Swensson was key to attracting such strong exhibits. Swensson said she is also proud of the Museum’s efforts to reach into the community with programs such as Art for All, launched in 2004 soon after she arrived, that continues to involve low-income and at-risk children in art- making projects. HMA board member Trish Johnson said Swensson worked hard to connect the Museum with all parts of the community. Swensson promoted diversity not just among people, but in art as well, Johnson said. In 2014, the Museum joined with the Hickory Pubic Library and the Hickory Community Theater to present a celebration of the play “Crowns,” about church hats worn by African American women. As part of the celebration, the Museum hosted a display of hats from members of the community. Looking to the future, Swensson said the Museum has developed a partnership with the Downtown Newton Development Association and the City of Newton to sponsor the Foothills Folk Art Festival that will be held in historic downtown Newton on Saturday, October 1. This event is based on folk art festivals that HMA has held in Hickory and in Sherrills Ford since 2005. Later this year, the Museum will feature contributions of women in the visual arts, including a partnership with Hickory Printing Solutions, which will produce a catalog and calendar for the exhibition “Woman Made: Women Artists from the Hickory Museum of Art Collection,” December 17, 2016 – April 23, 2017. The exhibition is being guest curated by Karin Borei. Additional community groups are encouraged to contact HMA to play a part in this multi-faceted celebration of women artists. Swensson began as executive director in December 2003, when she and her husband, artist Dan Smith, moved to Hickory. Before that, she was director of the Peninsula Fine Arts Center in Newport News, Va., from 1995 to 2003. She also has been chief art curator at the South Carolina State Museum in Columbia, S.C., director of the Fine Arts Center of Kershaw County in Camden, S.C., and a high school teacher and coach. Anyone interested in being considered for HMA’s executive director position will find application instructions at http://hickoryart.org/employment/ or by emailing execdirsearch@hotmail.com. Hickory Museum of Art is located on the SALT Block, 243 3rd Avenue NE, Hickory. Admission is free. For more information about Museum exhibitions, art classes, field trips, and events, visit www.HickoryArt.org or call 828-327-8576. The Foothills Folk Art Festival is now accepting artist applications for the juried festival, which will be held in downtown Newton on Saturday, Oct. 1. Thanks to a partnership between the Downtown Newton Development Association and Hickory Museum of Art, the festival—formerly known as the Lake Norman Folk Art Festival—will make Newton its new home. The free festival will be held from 10 a.m.-4 p.m. Saturday, Oct. 1. A first look at ten of the works added to HMA's collection so far in 2016, whether through purchase or (mostly)generous gifts for which the Museum is grateful to its donors. The works were accepted by HMA's Acquisitions Committee at its monthly meetings. All were chosen with a view towards how best to exhibit each one in the future. Paul Whitener, HMA's founder and first director, collected nine William Edward Bloomfield Starkweather paintings while director, most of them gifts from the artist to the Museum. In 2015 HMA was given eight more, gifts from collector and Starkweather expert Peter Falotico. This exhibition will run through August 14, 2016, and features a selection of new and old acquisitions, as well as correspondence from Starkweather to Paul Whitener. Inspired by the music of jazz giants Miles Davis and Dizzy Gillespie, James Biggers depicts visual rhythm through colors, shapes and forms. A native of Gastonia, N.C., Biggers describes his most recent body of work – which includes digitally manipulated photographs – as an extension of the Harlem Renaissance Era. He is the nephew of artist John Biggers, an African-American muralist who came to prominence after the Harlem Renaissance and toward the end of World War II.